The following is a short introduction to Lamentations I wrote for the Bible Briefs series published by Virginia Theological Seminary and Forward Publishing. It is available in a lovely pdf as a free download here. The book of Lamentations is one of the smallest works in the Bible and yet one of the most powerful and enigmatic. Written in the aftermath of the destruction of Jerusalem and its temple in 586 BCE by the Babylonians, Lamentations expresses the grief and disbelief of those who lived through the horror and yet still looked to their God. Not just an outpouring of emotion, however, the book of Lamentations also contains a profound theological reflection and response to the problem of sin and suffering. The five poems that make up the book of Lamentations move constantly between the cry of anguish at the condition of Jerusalem and her people to the fear that God may have finally rejected Israel forever, and to the affirmation that the Lord is the one who has allowed this to happen and yet God may still have mercy on them if only they repent. It is perhaps this challenging content with its powerful emotions and accusations against God that have caused this little book to be so often overlooked in Christian tradition. The emotions expressed within these poems are raw and dramatic. Written most likely by those who witnessed the atrocities recounted, the book of Lamentations depicts the horrors of war and living in a city under siege. It dares to call out to God asking how—how could the Lordpossibly allow such a thing to occur to God’s people Wars, hardships, and strife continue to this day, and so the example of Lamentations and its nascent message of faith remain relevant to the contemporary community of faith. Almost all scholars agree that the book of Lamentations was written in the years immediately following the destruction of Jerusalem in 586 b.c.e.. Certainly these five poems express the kind of shock and despair that we might expect from an eyewitness, yet their form and style demonstrate that they were created as an act of reflection on, and as a memorial of, their tragedy. Lamentations does not contain any glimpse of the restoration of Jerusalem and the temple that occurred after Cyrus the Great and the Persians defeated the Babylonians and allowed the Jews to return and rebuild their holy city in 538 b.c.e. Thus the time of composition is set within the years immediately following the destruction and prior to Jerusalem’s restoration. Moreover, it is likely that the poet was one of the many who were not exiled to Babylon, but remained in Judah and endured the daily reminders of the Babylonian conquest. Jeremiah has traditionally been ascribed as the author of Lamentations, largely based upon the reference in 2 Chronicles 35:25 to Jeremiah’s having composed laments for the death of Josiah, but also due to the similarities in message and vocabulary between portions of the books of Jeremiah and Lamentations. Since the book of Lamentations is composed of five separate poems, many scholars have posited several authors and that is a distinct possibility. The text of Lamentations itself is, in fact, anonymous and most scholars agree that it is unlikely that it is the work of the prophet Jeremiah. In many ways it is the anonymity of the work that provides it with such great power, especially for today’s reader. It is not a work by a named and distant prophet; rather, it is a work that could be penned by anyone who has gone through such tragedy, and readers are invited to identify themselves with the authors’ perspectives. This becomes most powerful with the so-called “everyman” of chapter 3, as we shall discuss below. Lamentations is a collection of five poems, each intimately related by both structure and content and yet each a separate work. The first four poems are acrostics, that is to say the first letter of each of their verses (or “stanza”) is a successive letter of the Hebrew alphabet. Thus the first stanza of the collection begins with the Hebrew letter aleph, the second with beth, and so on. There is variation within this form. In chapters 1 and 2 each stanza contains three lines or “couplets” and each stanza is introduced by a successive Hebrew letter. (That is, a new Hebrew letter begins the first word of each verse of these chapters, introducing a new set of three lines of poetry). Chapter 4 has a similar pattern, but with only two couplets per stanza. Chapter 3 consists of three-lined stanzas like chapters 1 and 2, but the stanzas have greater intricacy. Every couplet within each stanza begins with that stanza’s unique Hebrew letter (so the first three verses of chapter 3 form a stanza of three lines that each begin with aleph, and so on). The final chapter does not have an alphabetic acrostic but echoes the acrostic form, since it has twenty-two lines paralleling the twenty-two letters in the Hebrew alphabet. Another key feature of Lamentations is the rhythm of the poetic lines. In biblical Hebrew poetry the fundamental unit is the two-part line, or “couplet,” with each half-line usually of similar length. In Lamentations, and in other lament poems in the Bible, many of the line segments are of unequal length, the first being longer than the second. This “limping” pattern is referred to as qinahmeter and provides a solemn and mournful rhythm to the recitation of the poem. The lament genre dominates Lamentations and has particularly strong parallels to the city-lament genre widely attested in Mesopotamian literature. Some of the key features of the city-lament genre that have been incorporated into Lamentations include the structure and form, the assigning of responsibility, the abandonment of the city by its patron deity, the weeping of the female figure (Lady Zion), lamentation, and the restoration of the city. But Lamentations also has strong parallels with biblical laments, both communal and individual. 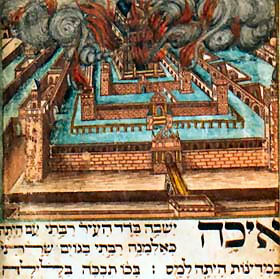 The result is a transformation and adaptation of the various forms and styles known from biblical and extra-biblical sources into a unique Judaean lament of the destruction of Jerusalem. The most significant departure from the city-lament genre, and yet what places Lamentations firmly within the biblical tradition, is that the destruction of Jerusalem is notattributed to the action of a capricious god. While God is always the primary agent in that God allowed Jerusalem’s destruction (“the Lord has destroyed without mercy all the habitations of Jacob,” 2:2), the author of Lamentations makes it abundantly clear this has only come about because of Judah’s sin. “Jerusalem sinned grievously, therefore she became filthy” (1:8; see also 2:14, 17; and 3:25-33). As we shall see, the destruction of Jerusalem and the suffering caused was viewed as a result of Judah’s actions; God’s punishment was just. The question is, would God now have mercy and once again show favor on the people. Each of the chapters of Lamentations takes a slightly different perspective on the crisis that precipitated their creation, each with their own emphasis, yet their presence together within the canon reveals the unity of their message.Chapter 1opens with the mournful cry ‘Ekhah, “Howlonely sits the city.” The tragedy seems to go beyond comprehension as the holy city that had been so great, so beautiful, so powerful, has been emptied of her glory and reduced to rubble. Throughout Lamentations, Jerusalem, or “daughter Zion,” is personified as a woman who has become a widow, been violated, and mourns alone and without friends. The authors contrast Zion’s former status as a great city and ruler with her current condition of abuse and abandonment (1:6; 2:15). She recalls “all the precious things that were hers in days of old” (1:7); while no friends came to help, “our eyes failed, ever watching vainly for help” (4:17). Two facts are made clear from the outset. The first is that it is the Lordwho has caused the destruction of Jerusalem and the temple. Zion’s enemies are only able to conquer her “because the Lordhas made her suffer” (1:5). Furthermore, God is often described as being directly responsible, “I am one who has seen affliction under the rod of God’s wrath” (3:1) and “you have wrapped yourself with anger and pursued us, killing without pity” (3:43). The second is that the reason God has brought this upon the holy city is “for the multitude of her transgressions” (1:5). God would not have been moved to punish had the people not sinned. “The Lord is in the right for I have rebelled against his word” (1:18). The fact that “daughter Zion” is given voice in Lamentations creates a dialogue with God and allows the reader to appropriate her suffering as our own (or to see our own suffering in Zion’s). While many prophetic texts speak of “daughter Zion” and her humiliation (especially Isaiah, Jeremiah, and Micah) it is only in Lamentations that she speaks for herself. The result is that her condition is both more poignant and more personal. The reader is drawn into her suffering as the text moves into the first person, “hear, all you peoples, and behold my suffering” (1:18). As the dialogue develops the city, the people, and the reader cry out together to God demanding a response, “Look, O Lord, and see how worthless I have become” (1:11). The latter portion of the chapter describes the attacks of the enemies and concludes with a plea to God to bring these foes to justice. “Pursue them in anger and destroy them from under the Lord’s heavens” (3:66). In the middle of this chapter that is in the middle of this book resides a poignant confession of faith and hope. God remains judge and that judgment is just, but in spite of all the suffering the poet declares that “the steadfast love of the Lordnever ceases, his mercies never come to an end” (3:22). Verses 22-42 call the reader to repent and return to God so that God may bless the people. “The Lordis good to those who wait for him, to the soul that seeks him. It is good that one should wait quietly for the salvation of the Lord” (3:25-26). The practice of lamenting, expressing our feelings of grief and confusion, is something that we have all but lost in western Christianity. As a result we have tended to interpret Lamentations by focusing upon those moments of confession and contrition, preferring passages such as those in chapter 3 that speak of the poet’s faith in God and the Lord’s justice. But Lamentations was written as an expression of grief and while it certainly contains the language of confession (e.g., 1:8; 2:14, 17; 3:25-33) these poems are raw and poignant replies to the atrocities that the poet had just survived. They cry out in their lament, describing the horrors of an eighteen-month long siege that led some mothers to cannibalism (4:10) and the young men and women to be crushed by their enemies (1:15). How does one respond to such horrors? Lamentations demonstrates that at least part of our response is to continue the conversation with God. We may be suffering and angry and full of doubt, but we must continue to express honestly our feelings to God, crying out “See, O Lord, how distressed I am!” (1:20). It is only in such openness and honesty with God that we can fully understand and know our own condition and God’s sovereign role in our lives. Like daughter Zion, we must acknowledge our sins (“her uncleanness was in her skirts; she took no thought of her future,” 1:9) even while demanding that God look upon our situation and have mercy (“O Lord, look at my affliction, for the enemy has triumphed,” 1:9). All too often in modern western Christianity we focus upon our need to acknowledge our sins and call upon God’s mercy that we fail to also acknowledge that the judgment comes from God as well. Our poet states “who can command and have it done, if the Lord has not ordained it?” before calling the audience to confession and obedience. Even as the author leads us into continuing the dialogue with God we confront the most theologically challenging aspect of Lamentations. Where was God during this tragedy? Where is God now, as we seek to make sense of our own tragedies?The book of Lamentations brings this question home with dramatic power through silence. Although the poet repeatedly appeals to God, God never responds; the divine voice is not heard. “Look Lord!” is a refrain that is repeated throughout Lamentations (e.g., 1:9, 11; 2:20; 5:1). Yet even as the personified Zion begs God to see her plight, she has already been ravaged. Zion’s cry for God’s help and mercy echoes hollowly and there is no reply. The destruction and horrors visited upon Jerusalem and her people seem completely disproportionate to their sins. “The hands of compassionate women have boiled their own children” (4:10) and yet God does not speak. What could be said? The divine silence is awful. Into this silence the poet confronts Israel’s responsibility and confesses “the Lordis in the right for I have transgressed his word” (1:18). Rather than assume that God must not exist or that God no longer cares about his people, the poet leads us to reflect upon our role in the covenantal relationship with God. In so doing, we see that God’s role in destroying Jerusalem is not proof that God does not exist, rather it is evidence that the Lordremains the God of Israel who continues to care about God’s people by punishing them as a parent might punish their child. This seeming paradox is the same that we find in the cross. It is inexplicable to many that God would require the sacrifice of the Son for the sins of the world. It seems cruel and excessive and yet it is in reality the full depth of mercy and compassion since it is through Jesus’ sacrifice that salvation came to all the world. So it is that God continues to love Israel enough that rather the simply ignore or abandon them God continues to maintain his Covenant with them. In their obedience God promised to bless them, “but if your heart turns away and you do not hear, but are led astray to bow down to other gods and serve them, I declare to you today that you shall perish” (Deut. 30:17-18). God’s punishment is a sign that the Covenant remains in force and the Lordremains the God of Israel. Thus the insistence of Lamentations that it is the Lordwho sent fire from on high that “went deep into my bones” (1:13), while it may sound offensive to us, is a powerful statement of faith. In spite of all the famine, torture, and killing the poet continues to believe that his God, the Lordalone, is ruler of the universe and is thus capable of bringing about such utter destruction of the people. Furthermore, God has done so because God loves Israel enough to punish them and will ultimately restore the people to himself “for the Lord will not reject forever” (3:31). The Lord’s Covenant with Israel remains in force and the relationship will endure. And yet as the poets cry out to God and ask for mercy, God is silent. How often have we also suffered grief, pain, disappointment, and poured out our hearts to God, waiting for a reply? Lamentations contains the complaints, prayers, and petitions that any of us might address to God in our grief. It is true that God’s response is not found in the text, but it is found in history. While the poet recognizes the sins of Israel and declares God just in punishing them, the book ends with the question, “or have you utterly rejected us and are angry with us beyond measure?” Outside the book, within the text of life, God responded by fulfilling God’s word given through Jeremiah (Jeremiah 29:10) and God restored the people to Judah by the hand of Cyrus. At its heart Lamentations is about the relationship between God and Israel, a relationship that only continues because the people refuse to let go, refuse to assume that God has cast them aside, and choose to repent and return to God asking and waiting for God’s mercy. We too, no matter how great our distress and our sorrow, must be honest with God and not be disappointed when a voice does not crack the sky. God will reply through the text of our lives, we must simply be willing to read it.